Stayed March 2013 This Villa was just amazing and was everything we expected! We enjoyed the peaceful and quiet location, and enjoyed many days lounging by the pool. If we ever make it back to Koh Samui we will definitely stay here again! Stayed Feb 13 Thanks for help with organizing our Samui Stay. Beautiful villa, amazing sunsets from the massive pool. One could find everything to one's need for a 5 star holiday.Tiny minus, dishwasher not working. Otherwise highly recommended for people who are looking for tranquility and serenity. Stayed Nov 11 If you are after peace, isolation and complete serenity this is the place to be. The villa is truly decked out nicely with so much space. Every room was opened up so beautifully with fabulous views from every window in the villa. 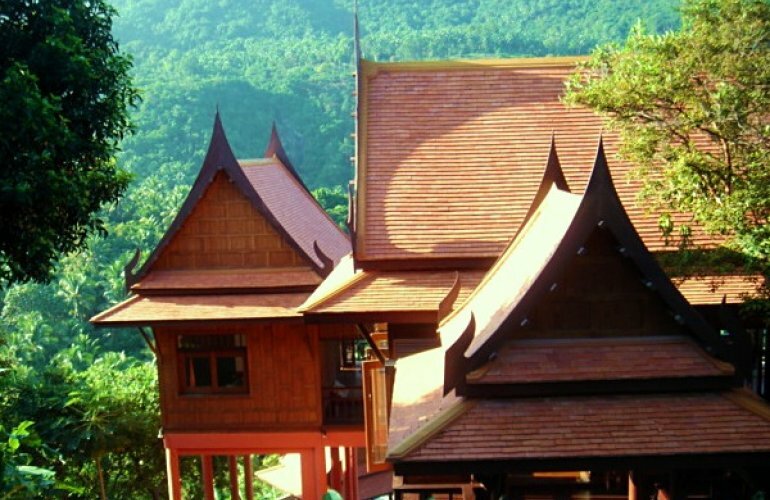 The traditional Thai Villa has all the modern amenities you need to make your stay more enjoyable. The host for the Villa, Mr. Sri made the stay even more memorable. Definitely recommend Villa to anyone looking for space, privacy and absolute luxury. Crafted into the tropical green landscape, this authentic Thai house provides infinite views of the mountainous valley, sprawling coconut plantations and the coastline beyond. The thoughtful layout of the accommodation, with stylish living spaces across three levels, offsets the colourful surroundings as a perfect example of the unique fusing of Western and Thai influences that the island's villas have become admired for. The villas traditional style wooden facade towers over the large private pool below; an exclusive and relaxing place to unwind, surrounded by a large terrace and overlooked by a shady sala with comfortable seating, where guests can lay back and luxuriate in the ambience of this peaceful place. An additional Jacuzzi with submerged seating is the ideal spot to chill out with cocktails on particularly warm evenings. The high columns of the property create an aura of space and magnificence, with tiered staircases leading you from the poolside to the higher levels and their wrap round balconies that provide excellent views. The three spacious air-conditioned bedrooms feature queen size four-poster beds wrapped in heavenly white cotton drapes that contrast beautifully with the rich wood surroundings. There is ample storage and hanging space and each bedroom has its own en-suite bathroom and a private balcony, making this an ideal retreat for couples, providing seclusion when sought. The open-plan entrance comprises a large lounge and dining area, with high vaulted ceilings, rich wood flooring and elegant furnishings. A further outdoor covered living area with comfortable seating and wonderful views makes a perfect setting for relaxing and entertaining. The kitchen continues to embrace this stylish theme, and includes a oven/hob, dishwasher, microwave and fridge/freezer. Just five minutes to palm fringed beaches and local restaurants and a mere fifteen-minutes to Bophut "Fisherman's Village" with it's restaurants, shops and entertainment, this villa has all the trappings of a secluded retreat, without becoming isolated.